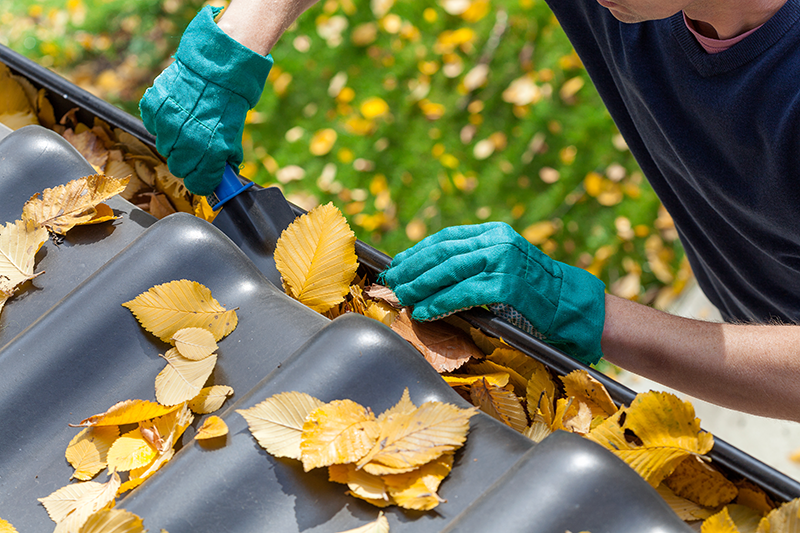 Like it or not, fall means it’s gutter-cleaning season. Cleaning your gutter is no easy feat; it requires patience and precaution to clean them effectively. Below, we detail the process of safely and efficiently cleaning your gutter, and also dive into methods that will help reduce your workload in the future. Cleaning your gutter is an easy chore to ignore, but the longer you wait to do it, the more difficult it will be. The first step in cleaning a gutter is checking the weather. Cleaning your gutter after a rainstorm is usually a bad idea, as wet leaves are a lot harder to deal with than dry leaves. If it’s a nice day out, gather a ladder, trowel, bucket, work gloves, and a hose with a nozzle. Once you have all your materials, you’re ready to set your ladder against the gutter and get cleaning! Clean the Large Debris First – Start gathering the larger debris near the downspout of the gutter, and throw the leaves and twigs in your bucket. Clean the Packed-Down Debris – If you haven’t cleaned your gutter in a while, there’s going to be a fair amount of debris packed at the bottom. Use a trowel to get this tightly-packed debris out and add it to your bucket. Wash Out the Rest with a Hose – Once all the larger clumps are gone, use a hose with a nozzle or gutter cleaning attachment to clean the rest of the gutter through the downspout. Start this process at the opposite end of the downspout. If Your Downspout is Clogged – For above-ground downspouts, feed the hose through the bottom of the downspout and turn on the water. This act should flush out anything that is stuck. If this doesn’t work, grab a plumber’s snake. The same process works for underground downspouts, but you’ll need to remove a section of the gutter before you can access the downspout. If you have a drain tile (a long black accordion-like hose) that attaches to the end of your gutter, be sure to keep this clean and clear as well, to avoid flooding. Cleaning your gutter is a routine chore, but there is still danger involved in doing so. Any task that requires a ladder has inherent risks attached to it. Make sure to keep the following in mind to limit your risk of injury while cleaning your gutter. Be Wary of Power Lines – Stay as far away from power lines as you can for safety purposes. Use a Step Ladder When Possible – Some areas of your home will likely be too high for a step ladder, but use one where you can. They are more stable than extension ladders. Also, make sure to never go over the second to last step of the ladder. Hook Your Bucket to Your Ladder – This tip is for both safety and practicality. It’s hard to toss the debris in your bucket when the bucket is on the ground, and if you set it on your roof, it will likely slide off. Keep your movement limited by hooking your bucket to your ladder. Use Latex Gloves Under Work Gloves – The debris at the bottom of your gutter is often damp, and this wet waste will seep through your work gloves. While it’s not strictly a safety concern, if you use latex gloves underneath your work gloves, you’ll keep your hands dry and clean. Gutter guards are the number one way to limit the amount of time you spend cleaning your gutter each year. They collect debris and allow water to pass through the gutter without any clogging. Gutter guards are a good idea for any home, especially those that are significantly affected by falling leaves and twigs. At DryHome Roofing and Siding, we offer the E-Z-Gutter Guard. This gutter guard sits on top of your gutter and collects the debris to prevent it from clogging your gutter. E-Z-Gutter Guards are available with small or medium holes, and hold medium-to-heavy debris. Half-Round Gutters: Half-round gutters are often found in older homes, and they’re designed with a circular bottom rather than a flat one. The E-Z-Gutter Guards fit in both of these types of gutters, with any of the traditional sizes. The guard is fitted with a spring tension that holds the guard in place, even under heavy, wet debris. You don’t have to worry about anything sneaking under the shingles either, as the EZ-Gutter Guard fits snugly under them. Once you have a gutter guard like this one, cleaning your gutter will be reduced to simply removing and cleaning your EZ-Gutter Guard. Contact the professionals at DryHome today to answer all of your gutter-cleaning questions.